Eigentümer Mila & Toni waren superfreundlich! Gerne wieder! A very clean, small and nice hostel with lovely staff. Rooms with nice beds and huge lockers. It is not in the old town but therefore quiet and still only a short walk to old town. Only minus point: no kitchen and almost no common area so not very social. Das Hostel war sehr sauber und schön eingerichtet. Die Mitarbeiterinnen waren sehr nett und zuvorkommend. Ein großer Vorteil sind die fest eingebauten Betten, in denen man nicht wie sonst bei Stockbetten wach wird, wenn sich der andere umdreht. 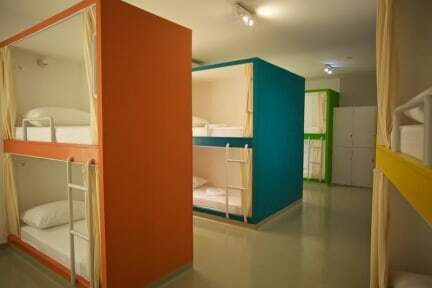 Very good hostel if you're just looking fo a nice place to sleep. 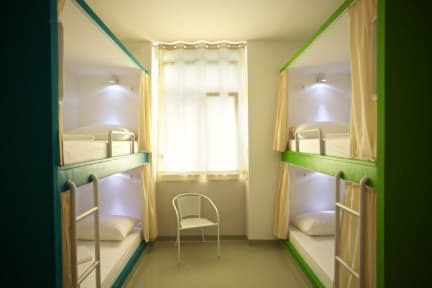 Despite it's a 10-bed dormitory, there's still enough privacy by the bed arrangement and the courtains in front of each bed. Beds are very comfortable. There is just a very small common area and unfortunately no opportunitiy to cook, just a microwave. It's nice that tee and coffee is free. I had a good sleep. Staff is very friendly and helpful. Nice & clean dorms with much privacy. Close to the City centre, although in a pretty quiet neighbourhood. No kitchen, only a microwave. No common area, neither inside nor outside, only one small table in the reception/entrance area - therefore pretty anonymous atmosphere. Attention! There are probably Bedbugs in this Hostel!